Can Budget spark a ray of hope in a no hope Market? The market opened the week with virtually no strength to inch higher inspite of positive global clues. The US markets were positive throughout the week but Indian markets infested with negative sentiments kept on dragging lower during the week. FIIs are standing on the sidelines, neither buying nor selling substantially. The media headline “Valuations in Emerging markets near 1998 low” justifies the loss in relentless selling momentum by the FIIs. The sentiments are running low, headlines like“Traders carry bearish bets.” point to extreme bearishness prior to the budget. These kinds of setups are an opportunity to be bullish when even absence of negative in the budget can cause stock market rallies. Rupee seems to be at a tipping point which will either go above 70 levels or below 68 in the medium term depending on the policy initiatives in the budget. We hope the budget will be growth oriented and forward looking in the best interest of the country. The second rail budget of the NDA Government kept the fares and freight rates unchanged but ushered a new digitized chapter in world’s third largest rail network corporation. The focus to increase efficiencies with the help of technology seems achievable. If the initiatives are implemented in a time bound manner, Indian railways can leapfrog to be one of the most efficient service providers yet affordable to the common man. Cement companies have hiked prices by 2-4% in the month of February in conjunction with increase in volumes by 2-3 %, a positive step for the entire industry. Solar Industries Ltd to became the first company to secure government licensing under the Make In India initiative to manufacture locally critical parts for artillery ammunition. Results of policy initiatives are visible on the ground level. 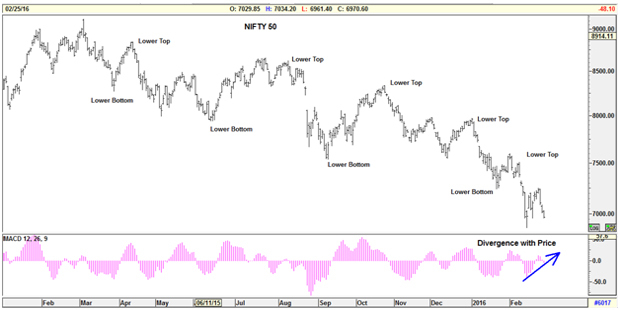 The market is continuing to make lower tops and lower bottoms in the medium term, however in the short term there is a visible loss of momentum to the downside. The velocity and breath are showing signs of divergences, a good short term indicator for a bounce back.After the steep fall of the current week, a bounce can be expected coinciding with the budget day. Put Call Ratio stood at 0.93, up from previous week reading of 0.85 indicating bearishness is waning and bulls are gaining strength.The market is likely to gain strength only if it crosses above 7300 levels in any case stops should be kept below 6900 levels for Nifty50 for long trading positions. The market is waiting for a trigger, budget being an annual exercise plays an important role in setting expectation levels for the markets. However based on historical evidence, budgets do not change the trajectory of the markets, meaning a bullish market will take the budget in bullish spirit and vice versa for bearish markets however there is only 15% chance that budget can actually change the trajectory of the market, i.e. market reverses its main trend post budget. It is also a wise principle in financial markets not to predict, hence at this juncture, it would be prudent to wait and watch the policy framework before taking a trading call, although this time the odds are that market will take the budget as a bullish signal. As far as valuations are concerned, they are at multi year low, which makes a compelling case for the investors to load up quality stocks and keep holding the rest. Nifty 50 ended the week down by 2% and closed at 7029.75. The market opened the week with positive sentiments after nightmarish previous week’s fall. Metals and PSU Banks which were hammered due to poor performance were the major gainers for the week. Bank of Baroda announced that all the bad assets have been provided for in the 3rd quarterly results which reignited confidence in the stock. NIFTY made single biggest gain of the year on Monday by rising 2.60% from the previous day’s close. Record bad provisioning of the banks aroused voices, with even the Supreme Court raising concerns, whereby RBI was directed to disclose details of bad loans. However the market seems to have thoroughly discounted the NPA issues leading to stabilization in the PSU Bank stocks. Third quarter result season is almost over, at the aggregate levels, sales declined by 4.4% and net profits fell by 1.7% for 2500 database of companies. FIIs continued their selling spree albeit at much slower pace on worries of slowdown in the economy. Rupee seems to have lost momentum on the upside. The market is awaiting positive triggers from the domestic front. Hopefully the citizens of India would see the Parliament functioning during the budget session. People’s Bank of China, PBOC set higher reference rate for the Yuan against Greenback after a long time in a sigh of relief for the emerging markets bringing in much needed stability for Rupee vis-à-vis Dollar. The stability on the currency front can bring back foreign portfolio funds back into the country. Make in India initiative kicked off with a grand success, the vibrancy of the event and participation instills lot of hopes going forward for the country to become a global manufacturing hub. Dr Reddy announced buy back of its shares up to a maximum price of Rs 3500/- per share in an indication of show of inherent strength in the company. After the steep fall in the market, reaching oversold levels it is time for a bounce back or sideways movement. Put Call Ratio stood at 0.85 indicating bearish moods. The market is likely to gain strength only if it crosses above 7300 levels, beyond which all shorts can be covered, and traders can initiate new longs. The series of lower tops and lower bottoms are still intact indicating no confirmation for long term reversals. Market is likely to see lower volatility in the near term. The upward movement will be slow and lethargic facing resistance at higher levels. The market is expected to stabilize at current levels. Major crude oil producing countries have committed to cap the supply at January levels, a step in the right direction to bring stability and equilibrium in the oil prices. The Dollar is facing resistance at higher levels and soon could correct in light of PBOC’s fixing higher reference rate for Yuan. Overall, there seems to be stability returning in the commodity and equity markets. The listing of new IPO of Quick Heal at 9% discount to the issue price indicates utter pessimism, which are in fact great opportunities for the investors to lap up quality stocks at fair valuation for long term investment horizon. When the sentiment peaks towards pessimism, new bull markets shall emerge. Currently the pessimism levels are high and expected to peak soon. Nifty 50 ended the week down by 3.29% and closed at 7210.75. The market opened the week with utter despair, reacting to the gloomy mood of other world indices. The intensity of the despair peeked mid week, culminating into a vertical collapse of prices. Such kind of utter pessimism throws an indication that bear markets are nearing an end and not the beginning. The events that shook the faith of Indian capital market were the declaration of results of the PSU Banks. Reported Gross NPAs to the extent of 9% to 10% was a total shock to the investors, leading to profits being wiped out for the quarter, and Banks have indicated that more can be expected to for the next quarter. This lead to complete loss of confidence and along with PSU Banks, all other companies having huge debt was beaten down. The sooner PSU banks come out clean, the sooner the confidence will be restored as markets don’t like uncertainty. PNB reported a 93% fall in Q3 PAT, SBI reported a 62% fall in Q3 PAT, Tata Motors Q3 PAT was down by 2%, Coal India Q3 PAT was down by 14%, ONGC Q3 PAT down by 64%, Hindalco Q3 PAT down by 89%, Hero Moto Q3 PAT up 36%. FIIs continued their selling spree however the intensity was not severe. Nikkei, Nasdaq touched their 52 week lows, HangSeng touched a three year low and European markets touched their low points for the year. Gold touched 52 Week high. The current equity sell off is largely a synchronous global event which will not last for long time, the markets will soon respond to the inherent domestic economic strengths, bringing in much needed stability in the financial ecosystem. Supreme Court this week ruled that debt recovery to take precedence over efforts to revive the sick units when 75% of the secured creditors so desire. This is a far reaching judgment clearing the hurdle for the banks to quickly recover the funds in a time bound manner. Government finally imposes restriction on cheap steel imports by raising the minimum import prices for various grades of steel from 30% to 70% to protect the domestic industry. This will ease pressure not only on steel industry but also on the banks as the certainty for recovery of interest and principal increases. The steep fall in the market has taken off all the important supports levels. The market is in no mood to reverse till it gains strength to cross above 7300 levels, beyond which all shorts can be covered, and new longs can be initiated from a traders’ perspective. The series of lower tops and lower bottoms are still intact indicating no confirming signs of long term reversals. Market is likely to see higher volatility in the near term. The upward movement will face resistance at higher levels. Traders should remain on the sidelines as the increase in volatility can lead to huge whipsaw loses. The market is expected to remain volatile, with equal probability of 2 to 4 % move on either side. The current state of hyper pessimism can’t last forever. When fear grips markets, rationality is by passed and people take decisions based on emotional behavior. Such emotional decisions are more often wrong, based on empirical learnings. Every time such heightened pessimism occurs the human behavior becomes automatic and investors sell off their investment holdings only later to repent. The distilled wisdom- “When others are fearful be greedy and when others are greedy be fearful” in other words ‘buy low, sell high’ should be the strategy for the investors, but majority reverse the rule. It’s time to keep patience in good quality stocks and sit tight. Nifty 50 ended the week down by 6.78% and closed at 6980.95. The market opened the week with positive sentiments but profit booking and fresh shorts emerged at higher levels on the back of weak corporate results, especially in the PSU banking space. However macro data signals revival in the economy- sales of heavy duty trucks grew 36% in 2015 compared to previous year, an indication that infrastructure and construction are gaining vibrancy. Services PMI stood at 19 month high and manufacturing recorded a four month high reflecting revival is gaining momentum. FIIs selling reduced considerable for the week, while DIIs continued their usual buying spree. Bajaj Auto reported 5% rise in Q3 PAT, DLF reported a rise of 24% in Q3 PAT, Cera Sanitaryware reported 21% rise in Q3 PAT, Ajanta Pharma reported 19% rise in Q3 numbers. Tata Steel reported higher than expected loss at Rs 2127 Crs for Q3. The markets are trying to find a bottom, searching for reasons to stabilize. Valuations are turning attractive, quarterly numbers are slightly below the expectations, going forward markets will rise albeit slowly, testing investors patience. RBI in its Bi-monthly policy statement kept the interest rates unchanged putting the ball in the government’s court to deliver first. RBI came out with a new set of guidelines to get Banking License allowing 74% FDI at the time of application itself rather than waiting for five years, making it easier for the new entrants to aggressively rollout, challenging the existing pie of Private sector Banks. Rel Infra finally agreed to sell its Cement business to Birla Corp for an enterprise value of Rs 4800Crs marking an exit from non -core business. Teamlease IPO got overwhelming response by getting 66 times over subscription, giving a ray of hope to many others waiting in the queue to raise funds. The anemic rally with equal bouts of buying and selling is an indication that market is likely to see choppiness in the near term. However it will again try to touch 7600 -7700 levels before any substantial movement can restart. 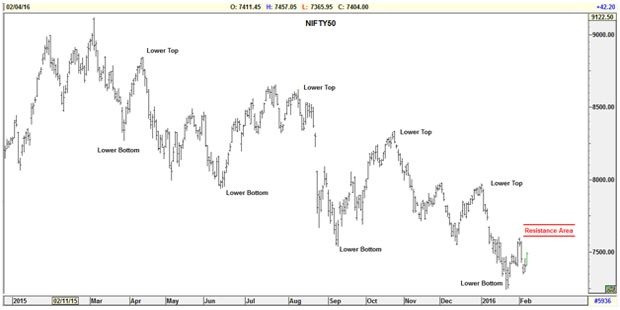 7241 levels on NIFTY50 would still hold as strong support area. Markets however continue to make lower tops and lower bottoms, from the medium term perspective. The upward movement will face resistance at higher levels. Traders should buy on dips and Investors can systematically add to their portfolio of quality stocks and keep patience.